In the world of tool watches, toughness is a necessity. If you’re in space, underwater or just roughing it up on land, you can’t have a delicate watch that acts up especially when put under harsh pressure. Fortis knows this and built their reputation on making timepieces that go above and beyond what the environment demands. For example, in 1994 Fortis decided to prove their claims by pushing their watches to the limits of modern physics. The timepieces kept their composure, a testament to their solid construction. Fortis put its money where its mouth was and the Star City Training Center located in Star City Russia took notice. This training facility for Russian cosmonauts decided to make Fortis the Official Cosmonauts Chronograph as part of their Official Cosmonauts equipment. And, it performed as advertised both inside and outside the shuttle. To this day, the Russians still use the Fortis Official Cosmonauts Chronograph as their official watch. Fortis has a long history of producing chronographs, starting in 1937 when they released their first one in celebration of the 25th anniversary of the company. 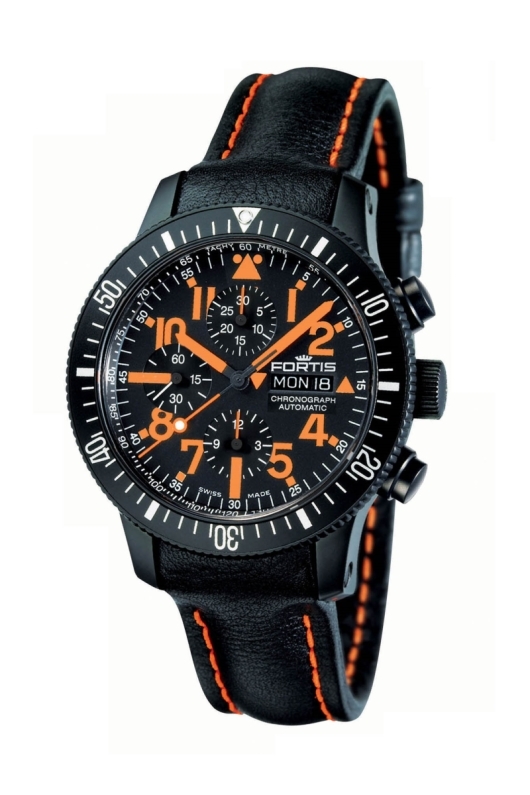 This year Fortis put out a dive watch with a chronograph that is right on trend with orange accents. If you take a look at the offerings at Basel this year, orange was one of the colors that many of the brands highlighted. For the Fortis B-42 Black Mars 500 Chronograph, with the chrono layout at 12 o’clock, 9 o’clock and 6 o’clock, the orange Arabic numerals and hands on the black dial not only give the face a snazzy pop, but also make reading the time much easier underwater. In addition, as per dive watch requirements, the numbers and hands of the Fortis B-42 Black Mars 500 Chronograph are coated in lume and the orange glow is pretty cool. Of course, there is a unidirectional bezel for safety, and the B-42 Black Mars 500 Chronograph is water resistant to 200 meters, which translates to 660 feet. The B-42 Black Mars 500 Chronograph comes in a 42 mm titanium case with a titanium bezel coated in PVD and is secured to the wrist by a calfskin band with buckle. A nice convenience is the day and date function located at 3 o’clock and the tachymeter used to measure speed and distance. The watch runs off an automatic Swiss movement and is a nice addition to the Fortis line of chronographs.